Magazine – We make you build an awesome magazine site and this magazine theme is very easy to setup. If you like the Magazine theme, please don’t forget to rate it Magazine brings a modern approach theme, it support animations based on CSS3. This magazine theme is very lightweight and fast to load. This stylish WordPress Magazine theme, which is a fully responsive and looks great on any mobile device, comes with great number of excellent features such as: 17 widget (plugin), 7 Homepage patterns, 370 Icon, menu types, price table, and much more. 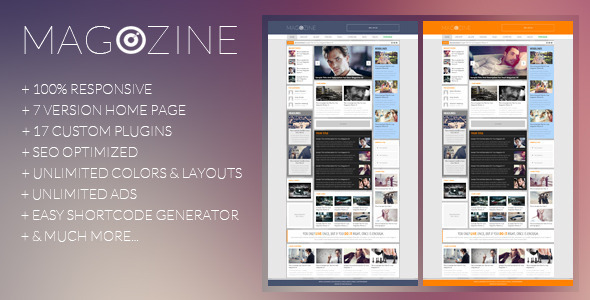 Magazine is a clean, stylish and professionally designed theme for anyone who wants to make great website or internet businesses. This theme is perfect choice for newspaper, magazine, editorial, personal blog, entertainment (movie, music and photography), and portfolio. WOW. This is an absolutely beautiful theme. I have received compliment over compliment over it. You get the vickystudio support team with it. And let me tell you they are INCREDIBLE. I’ve never received customer service to this level. I would PAY for updates for life because of how incredible they are. If you are on the fence of buying this. Buy it. Don’t even think about it. You can thank me later! EAWitkowski I just want to say this author goes beyond call of duty. He has responded to all my messages and has helped me a great deal. I would recommend him to anyone without a doubt. So far, purchasing his/her theme has been a pleasant experience; a 5 star experience. fashion77 AWESOME theme and even better SUPPORT!! Super fast and friendly. Thank you!! Jillsross Great! Simple and clean. How i like it. Panikspatz Great theme! One of the best themes I’ve seen in Themeforest for this year. MattRobinson Just bought the theme today and I think it is brilliant!. JackDavis2017 I just needed a clean layout and this theme has that with a few nice extra features. Devosbram I’ve purchased many themes but they all fall short because they require some coding or changes in the FTP, etc.. which is beyond me. But this theme…has me excited. You have talent and I’ll be keeping a look out for future themes. flickimp P.S. If you bought theme and don`t know how to set it up or how it works, please do not rate it by 1 star, but please send us a question via Contact form (right bottom corner) or please create a new topic on support forum and our support team will help you with all your problems/questions within 24 hours.